They say that time marches on, and for proof of that just head to Edinburgh. An incredible seven years ago we opened our first BrewDog bar for the city (and only our second bar anywhere) in the Cowgate – so it’s high time we followed that up for the beer-loving people of the Scottish capital. Ladies and gentlemen, your latest hop hideout awaits. Edinburgh is officially a two-dog town. BrewDog Lothian Road opens at 12pm today, Friday 26th January! 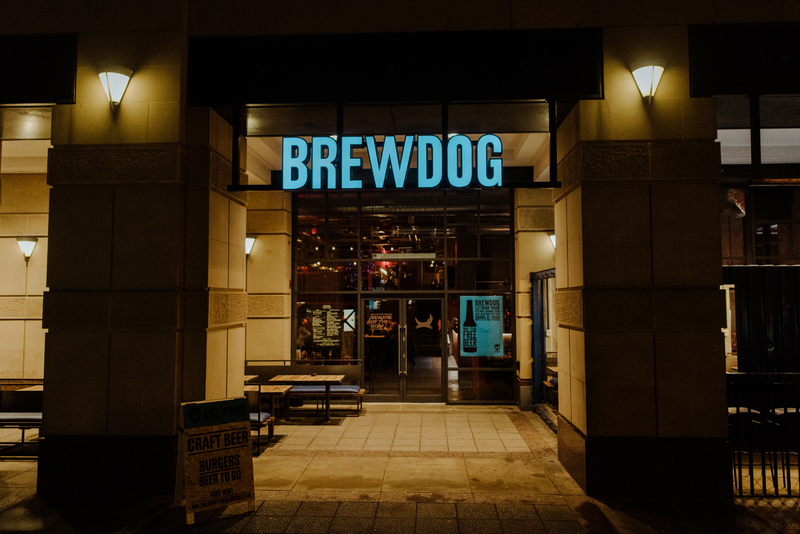 Located at 50 Lothian Road, Edinburgh (EH3 9BY for postcode fans) our newest UK BrewDog Bar is in a killer position on the corner of Festival Square directly opposite the hundred year-old Usher Hall. We love the hustle of Lothian Road connecting the west end of the city centre to all points south, so when the old Clydesdale Bank building came up for grabs we snapped it up. Inside, GM Chris and his handpicked crew of hop lovers are ready and waiting with 20 taps of super-fresh craft beer from ourselves and other craft breweries we love, alongside a range of wines and spirits including LoneWolf gins, vodkas and cocktails. The bar also has a fully-primed BottleDog ready and waiting for anyone wanting takeout beer in the city centre or dashing to Haymarket for that last train. Our Cicerone-trained staff are happy to provide advice and tasters for anyone new to craft beer, and alongside the comfy seating and booths we also have an outdoor drinking area for the warmer months (or right now for those bundled up) – it is fully covered to keep the elements at bay. Our new bar is the perfect stopping off point before a gig or concert in the festival city! For those wanting to stay a while longer BrewDog Lothian Road also offers a full food menu, rocking our super-popular burgers and wings during the day and at night (with beer pairings suggested by our crew of course). BrewDog Lothian Road opens its doors at 12pm today, Friday 26th January and will then be open 12pm-1am Monday to Friday and 11am-1am Saturday and Sunday. The first 100 peoplethrough the door this Friday at 12pm will be entered into a raffle to win a year’s supply of BrewDog beer! How does that sound? We can’t wait to welcome the people of Edinburgh with this new BrewDog bar and make it their new craft beer hangout. Our original Cowgate bar is still going great guns (and is only a fifteen-minute walk away if you want to double them up) so we are truly excited to get a second beer for the city. If there’s anywhere else in Scotland you’d like to see up open up, let us know in the comments below!